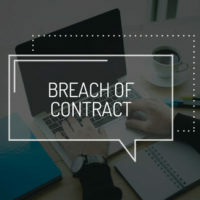 A breach of contract in business has the potential to be costly and financially devastating, especially for smaller organizations. If a client, partner, investor, or anyone else you have a working relationship with violated a written agreement, you have the option to sue the offending party. While not all violations are worth filing a lawsuit over, there are others that are. If the breach caused you to lose money in any way, or if it caused a rift between you and a third party (such as another customer or vendor), you should consult with a Fort Lauderdale business litigation lawyer about what you should do next. However, this post should give you an idea of what to expect before you contact an attorney. Not everything a person or entity does that dissatisfies you is a breach of contract. A breach of contract has to be to an act or non-act that is in direct violation of the written agreement. For instance, if you hired a freelancer to create a website, and in the contract you stipulated that he or she would receive 25 percent of the total payment upfront, another 25 percent once specified milestones were met, and the remaining 25 percent upon final approval of the project, and he or she collected the initial 25 percent of payment but then never got passed the completion of the first milestone, he or she would be guilty of violating the contract. On the other hand, if you make it impossible for the freelancer to satisfy the job outlined in the contract, you could be held liable for breach of contract. Fundamental Breach: A fundamental breach occurs when the breath is so fundamental that it gives the other party a right to terminate the contract on the spot and sue for damages. A fundamental breach generally deprives one party of what they should reasonably expect by contracting with the other party. Material Breach: A material breach occurs when one party fails to perform the duties specified in the contract. This is usually the most serious of breaches, as it usually results in non-payment for work performed, or lack of results for work paid for. Anticipatory Breach: As its name implies, a party may sue for an anticipatory breach when no actual breach has occurred, but when it becomes clear that the other party will not execute his or her end of the contract within the allotted time. For instance, if you hire someone to build and launch your website by January 1, but they have yet to meet any of the milestones by December 27, it is clear that your website will not be launched by the anticipated date and so you can sue for anticipated damages, such as lost sales. Minor Breach: A minor breach is a partial breach. A minor breach might occur when the freelancer completes the website as contracted by the specified date, but it has glitches that prevent it from fully loading on any device. Though you cannot sue for a material breach (the freelancer did complete the job, after all), you may be able to sue for monetary damages caused by the glitch, or for an order that forces him or her to make corrections. The defendant was responsible for the loss of money. Compensatory Damages: This type of award is meant to reimburse you for money lost due to the breach. Liquidated Damages: Some contracts specify what types of damages will be owed in the event of a breach. These are known as liquidated damages. Consequential Damages: These types of damages are awarded if all parties were aware that a breach would result in potential losses. Attorney Fees: If the court determines that a breach did occur, the defendant would have to pay for the plaintiff’s attorney and court fees in addition to his or her own. Punitive Damages: Punitive damages are awarded as a sort of punishment for overtly offensive behavior, and are meant to prevent the defendant from making the same mistake twice. Though punitive damages are rarely awarded in breach of contract cases, they can and have been awarded. Recession: The court may cancel the contract, order the return any money paid, and demand the matter to be dropped so that it is as if the contract never happened. Specific Performance: In rare instances, the court may order the offending party to follow through with the initial terms of the agreement. Reformation: A reformation may occur when the court feels that the contract was not suitable for what was being asked. In this instance, the court may rewrite the contract to better suit the actual intention of the contract. Breach of contract are some of the most commonly heard suits heard in small claims courts because oftentimes, a breach of contract can result in substantial loss for a business of any size. If you are dealing with a breach of contract, it is important that you know your rights so that you can quickly and effectively remedy the situation. Do not let a breach of contract ruin your business, and reach out to the law offices of Edward J. Jennings, P.A. to speak with a knowledgeable Fort Lauderdale business litigation lawyer about your rights today.